As cultural absurdities, apathy-inspiring ambient noise, and political and ecological disasters threaten the 21st-century world, art’s role in engaging society and coalescing dissent becomes more apparent and more urgent. 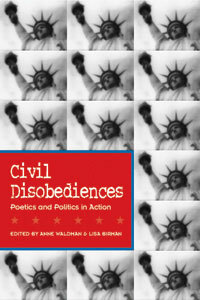 Civil Disobediences offers a manual for understanding poetry’s history and enacting its ultimate power to dismantle and recreate political and cultural realities. Contributors include: Helen Adam, Ammiel Alcalay, Amiri Baraka, Ted Berrigan, Robin Blaser, Reed Bye, Jack Collum, Robert Creeley, Samuel R. Delany, Robert Duncan, Lawrence Ferlinghetti, Alan Gilbert, Allen Ginsberg, James Grauerholtz, Barbara Guest, Bobbie Louise Hawkins, Anselm Hollo, Laird Hunt, Pierre Joris, Joanne Kyger, Ann Lauterbach, Harryette Mullen, Eileen Myles, Alice Notley, Michael Ondaatje, Sonia Sanchez, Edward Sanders, Eleni Sikelianos, Gary Snyder, Cole Swenson, Arthur Sze, Steven Taylor, Robert Tejada, Lorenzo Thomas and more. The Jack Kerouac School of Disembodied Poetics at Naropa University in Boulder, Colorado was founded by poet Waldman and Allen Ginsberg in 1974; it functions as a non-academic pedagogical laboratory (Waldman prefers Hakim Bey’s phrase, “temporary autonomous zone”) for synthesizing the energies loosed by the Beats, the poets of the Black Mountain School and other proponents of the literary counterculture, both ancient and modern. Its many teachers over the years have included Ted Berrigan, Robert Creeley, Joanne Kyger, Alice Notley and Michael Ondaatje, all of whom are represented in this culling of 40 presentations and colloquia from the school’s famous Summer Writing Program. With a conscious nod toward Thoreau, Waldman in her introduction attempts to articulate a varied poetics of engagement for our time. The various essays, lectures and teaching materials are divided into six sections (including Ancestral Presences, Dharma Poetics, Revolutionary Poetics, and Gnosis & Aesthetics) and cover a wide range of subjects (including gender, the environment and Buddhism) in ways that are refreshingly theory-free and conversational (many of the pieces were first presented as talks), while remaining erudite and informative. Highlights include a transcription of Ted Berrigan’s motormouth advice on “how to be a poet” from a workshop class in 1978, Peter Warshall’s presentation of the findings of the Maniacal Naturalist Society on the subject of “together living” or symbiosis, and James Grauerholz’s essay on William Burroughs and Zen. Taken as a whole, these various texts reaffirm the intersection of poetry and politics as a point where word and action can fuse powerfully.